One of the most beautiful quotes about marriage is something we came across in the book turned movie, The Notebook, by Nicholas Sparks: “Marriage is [about] becoming a team. You’re going to spend the rest of your life learning about each other, and every now and then, things blow up. But the beauty of marriage is that if you picked the right person and you both love each other, you’ll always figure out a way to get through it”. Since we’re at the start of SA Marriage week, which will be 1 – 7 September 2016, we decided to join in on the theme of “Do something, give something”. This is not just in terms of buying gifts for your significant other, this is also about the smaller things in life, such as making a sandwich and sharing it while sitting on the couch and watching a movie. With this in mind, we thought of a few ideas in which you can incorporate romantic gifts from NetFlorist to show your better half how much they mean to you. A happy marriage is about spending quality time together. Show your romantic side when you buy a dozen blood red roses and hide them from her all around the house. Start off with a little note at the door, leading her to the first rose and take her through the house until she finds the last rose which will be in your hand, as you smile like a silly loon! Escape the everyday life by packing a picnic basket filled with snacks and bubbly and take your significant other away to a beautiful place where you can enjoy the treats and each other’s company. In the end, that is what love and marriage is about – spending quality time together. The key to a successful marriage is doing things for one another. If you know that your significant other has had a rough day, fill up a bath with bath oil, a fizz ball and have a glass of wine handy for when she comes home. Little gestures like this can go a long way! Celebrating your six-month anniversary? Order a box of six doughnuts to celebrate the half dozen months together and make a toast to the next six months in a happy marriage. In married life, one sometimes has to stop amidst the hustle and bustle and make time for each other. Buy a couple’s moonlight spa voucher and enjoy the night getting a few treatments, dinner and just enjoying each other’s company. 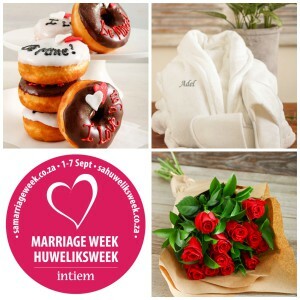 SA Marriage Week is about creating harmony in the home, and this includes sharing. Why not kick back and relax in the comfort of your love nest, and share a delcious dinner, complete with snacks and wine? We have a wide variety of snack and booze hampers for you to set the mood and give you a real chance to reflect. All in all, we want you to make sure that you use this week to reflect on your marriage, focusing on its wellbeing and creating harmony in the home. A successful marriage takes work, which is why doing small things for each other really goes a long way. No matter what you decide to do during SA Marriage Week, NetFlorist is here to help you make it beneficial!